The Sketchpad | Imagination is more important than knowledge. Here is the link to our portal. We hope the blog will be a good resource not just for BPS teachers, but for any K12 teacher interested in using LilyPad Arduinos. We have documented the design process for the project under the About Us tab. We appreciate the feedback received during our final presentation, and here is how we have addressed the issues. 1) How can teachers brainstorm ideas for the curriculum? We have created a Twitter feed, where anyone who visits the site can tweet their ideas directly into the feed. Additionally, we invite teachers and educators to give us feedback and suggestions through the Comments feature on the blog. 2) How can we show some high-end prototypes to inspire teachers, educators and students to learn about the LilyPad Arduino? We found some great examples on Youtube, and have featured them on the Homepage, explaining that the Starter Activities on the blog can be stepping stones towards building those awesome projects! We would like to thank Rafi, Christian, Kylie and the class for the invaluable guidance and feedback throughout the design process. Margolis, J., Fisher, A., & Miller, F. (1999). Caring about connections : Gender and computing. Technology and Society Magazine, IEEE, 18(4), 13–20. Margolis, J., Fisher, A., & Miller, F. (2000). 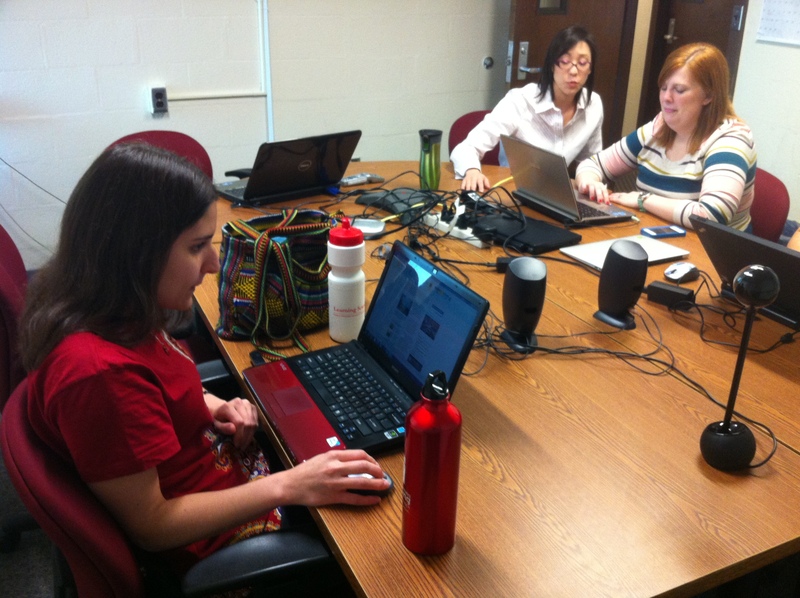 The anatomy of interest: Women in undergraduate computer science. The Feminist Press, 28(1), 104–127. Maloney, J. H., Peppler, K., Kafai, Y., Resnick, M., & Rusk, N. (2008). 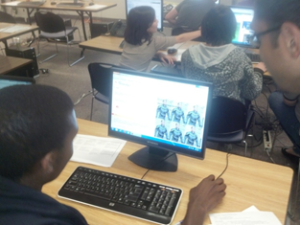 Programming by choice: urban youth learning programming with scratch. ACM SIGCSE Bulletin, 40(1), 367-371. Resnick, M., & Rosenbaum, E. (2013). Designing for Tinkerability. In M. Honey & D.E. Hunter (Eds.) Design, make, play pp. 163-181. Routledge, London. Bogost, I. (2005). 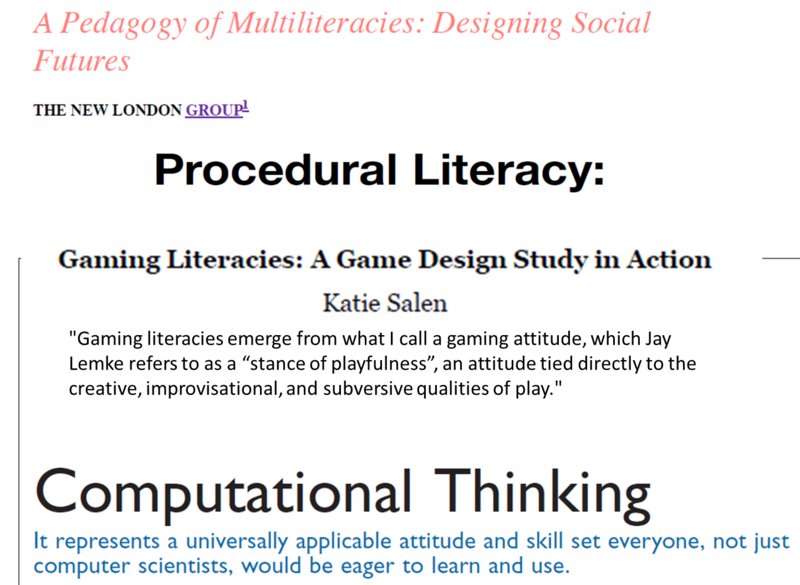 Procedural literacy: Problem solving with programming, systems, and play. Journal of Media Literacy, 52(1-2), 32-36. Cazden, C., Cope, B., Fairclough, N., Gee, J., Kalantzis, M., Kress, G., et al. (1996). A pedagogy of multiliteracies: Designing social futures. Harvard Educational Review, 66(1), 60-92. Salen, K. (2007). Gaming literacies: A game design study in action. Journal of Educational Multimedia and Hypermedia, 16(3), 301-322. Santo, R. (2011). Hacker Literacies: Synthesizing Critical and Participatory Media Literacy Frameworks. International Journal of Learning, 3(3), 1–5. At the beginning of the course we planned on working together in designing a Hackjam for adolescents to take place in June 2013. The goal was to come up with a user-oriented curriculum to teach writing and web designing skills with a potentially controversial ingredient, ‘hacking.’ The work went under several iterations in which our original design, as well as our understanding of what hacking really implies, developed and transformed. The process underwent several stages, from gathering evidence from a variety of users, a collaborative curriculum redesign, a pilot with our peers, and final considerations for the session. In the following lines we expand a little bit about these stages that illustrate our development of the Hackjam curriculum. 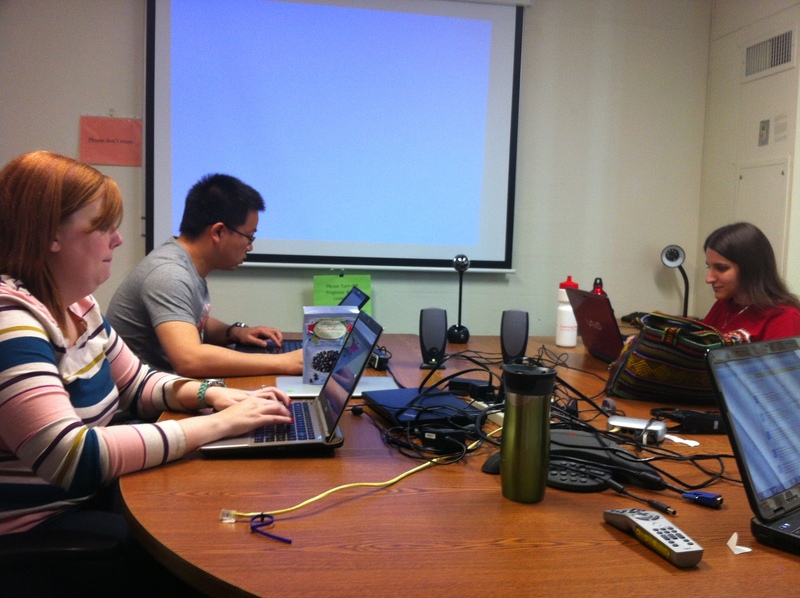 The first Hackjam was a success, so we were building on curriculum that was already good. Thirty 13 to 20-year-old adolescents participated in this six-hour jam in 2012. Participants used Mozilla’s X-Ray Goggles to alter and modify the HTML and CSS content of the Herald Times website and create their own stories. They created superheroes and supervillains who were then placed into the news stories as the young hackers remixed the content. But we were aware there was room for improvement. By the end of the six hour day in 2012, the students were tired and felt like they were doing redundant work. We have redesigned the curriculum to avoid this. In March we sent along a survey to participants of 2012 Hackjam to learn more about what they liked about the Hackjam and what they felt could improve. In addition, we also interviewed Phil Carspecken, a faculty in Inquiry Methodology program, for a fresh, extreme perspective on the matter. The survey included questions asking their opinions on the Hackjam and what they wouldlike to see if they came to the Hackjam again. While only three people responded, it was clear that adolescents enjoyed the experience overall, and they especially liked creating their personal wikis. However, they were a bit disappointed when they realized that their modified webpages did not actually change to original website but were stored in a Mozilla server. They commented they were excited about the possibility of making a real transformation, but had fun “legally” hacking a webpage with X-ray Goggles. During the interview with Phil Carspecken, he expressed this disappointment as well when we explained to him that this tool did not change the actual content of a website. He was joking about being able to change his own bank account, but the idea of making a real transformation was what seemed to be important when it comes to hacking. Phil liked the civic implications to teach children the idea of ‘hacking’ as a way to engage in deconstructing the form of the messages we receive from the media. In this way, children are able to critically explore the relationship between form and content, and how content helps shape the content we consume. Finally, he pointed out for us some readings about critical pedagogy that would help us in understanding more about this orientation. With these ideas in our minds, we took our backpacks and headed to Bloominglabs to collect some field-work data about a real hacking site from the Maker movement. Bloominglabs is located in a non-residential neighborhood so that attendants to its meetings can be noisy if their projects would require so. 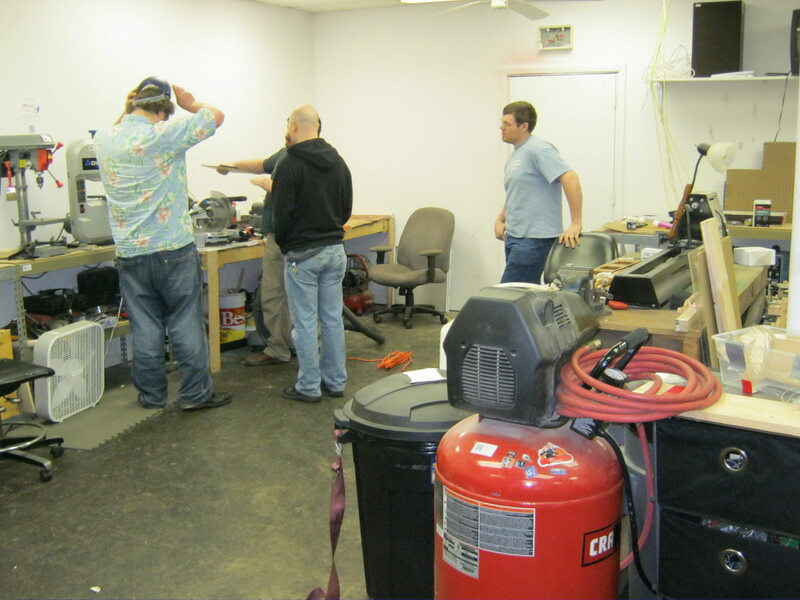 Inside its doors, an amazing wide range of hands-on activities take place; there is a livng room at the entrance where some people work on their laptops to create projects or chat about them; in an adjacent room there is a tools workshop with heavy equipment, an electric saw, a lathe machine, and a variety of carpentry tools. In a room to the right after the entrance, a lot of electronic components where lying on a big table. Some robotic projects for a local school were taking shape. Interestingly, participants of these diverse, hands-on eclectic projects were mostly socializing and intermittently worked pushing forward their designs. We learned that we would need to entertain a new meaning of the word ‘hacking,’ and we started to realize that the maker movement has retained a broader meaning of the word. 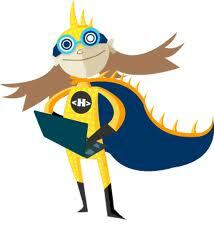 An electrifying inspiration energized our quest, and we set off to design a redesign the 2013 Summer Hackjam. The Hackjam curriculum is a pedagogical plan for a six-hour hands-on experience in which adolescents engage in writing literacies as a product of learning about HTML and CSS design. Our learning goals are aligned with the Common Core Standards for writing and New Media Literacies. We came up with eight different activities, which included an icebreaker, setting up wiki pages, using the X-Ray goggles, developing a superhero or supervillain, hacking the Herald Times, and sharing their hacks. A wiki website was set up (http://hackjam.wikispaces.com/) that centralizes all the activities and resources that we put into the curriculum. Because we intended to create a bottom-up learning experience in which children learned within a community of practice, we thought of adding up two participatory elements that would stir children practices. First, we wanted children to be able to write about how they were doing what they were learning of HTML by using the goggles on a shared space in which other participants would benefit of this pool of knowledge. A forum was conceived of as a place in which children could provide their insights, questions, and answers to each other’s questions. Young hackers are then encouraged to explore a platform that would support this participatory structure – we thought of including a digital badge and points system. 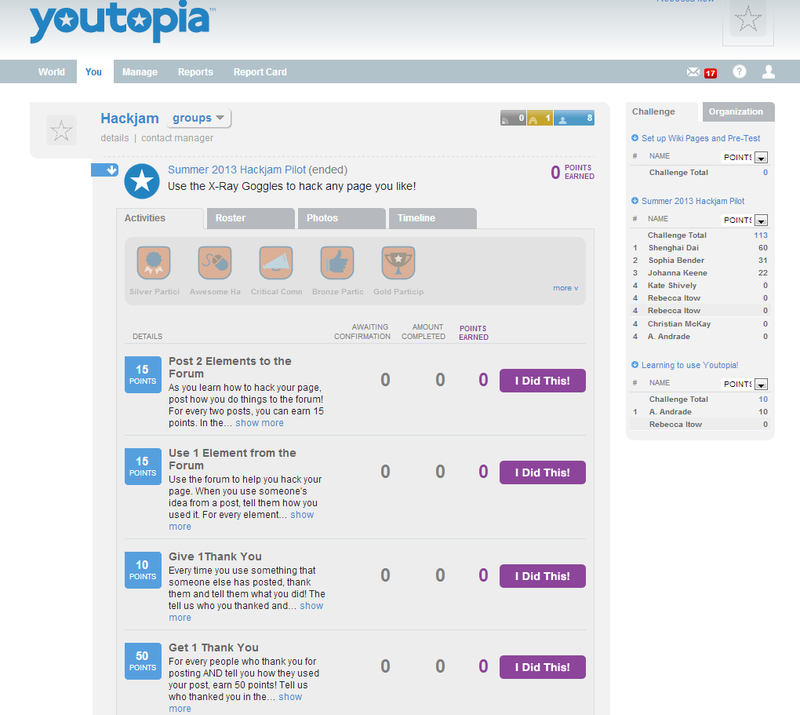 For this particular iteration, we found that Youtopia.com could fit our interests well. 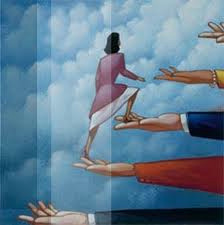 Youtopia is a site in which participants participate in challenges, which are further divided into activities. Participants apply for points and badges as they complete these activities. For the Hackjam curriculum, we designed a set of activities for which participants would apply for points. Participants would receive different amount of points if they participated in the forum with small pieces of know-hows, if they commented that they used each other’s pieces of information, if they ask questions on the forum, if they answer questions, and if they got other participants to endorse their forum posts as valuable. With this curricular structure in place, we decided to carry out a pilot session, a mini-hackjam with graduate students in a safe space in which we could try out these ideas. Three of our classmates joined the one-hour pilot hackjam, and evidence of this experience is accessible here (http://hackjam.wikispaces.com/2013+Synchronous+Pilot). Participants followed a 17-step-by-step direction on how to complete the hack, which included reflecting about what hacking is, installing the X-ray goggles, trying the goggles in whatever webpage they would like, participate in the forums, apply for points and badges, publish their hacks on their wikis, and leaving us their comments on this experience. It was time to reflect on what we had designed, and planned for a new iteration of the curriculum in which we could bring about this new source of feedback. First and foremost, the evidence was clear, forums, wikis, points, badges; all at the same time, they were overwhelming. Participants barely kept up the pace of understanding what they were learning, how they were supposed to share it, and how to participate of the competition. A simplified experience is called for. We are thinking of changing the approach to the forum and including comment features around the wikis to keep the activities and shared, participatory pool of knowledge tied to the artifacts. Still, we are undecided on how to promote participation with the Youtopia point structure, and we have our concerns on how much we are distracting children from their learning by gamifying the written reflections. We conceived of two possible outcomes, may be that children are encouraged by earning points to participate and an explosion of otherwise not possible interaction of such quantity and quality takes place, or participants may focus too much on earning points that it ends up undermining their learning. We think that a modest amount of external motivation would be required because we know by our previous experience that children are motivated to dig deep into their hacks. As we move forward and continue to refine our design of the Hackjam, we will take all that we have learned in this class and through our interviews and pilot into account. We have gleaned a lot of valuable information this semester that will directly influence the final design. While the activities are more streamlined now, we still have work to do regarding the points and badges, and in finalizing the forum activity. This process has brought to light many valuable insights about how to design the best learning space for youth while making learning fun and exciting. You can view our step-by-step process in our designer’s workbook (https://docs.google.com/presentation/d/15C0OCZh8DmamSb5Iz_3J5FaFlIncCUcL661wJ1MEYeA/edit?usp=sharing). This was a valuable experience and we feel our project is better for it. it has been a great time working with you all exploring the journey of design, and here Sophia and I would extend our sincere gratitude for your excellent feedback for our project, also we would like to thank Kylie for your continuous support throughout the semester. Attached is our final portal for the project and feel free to leave your comments : )! Margolis, Fisher and Miller (2000) discuss how gender socialization and cultural artifacts in computer science have been male dominated, and may have undermined women’s sense of their own intrinsic nature. To address this, there is a need to situate technology in a social context and to address the initial experience gap. Margolis, Fisher and Miller (1999) also discuss linking computer science interests to a larger societal framework – a “re-invisioning” of computer science. For our design, we tried to make our sample projects appealing to both boys and girls – they should be creative and related to daily life and social contexts. The learning process should be different from typical lab sessions, and teachers and students should be given the choice of project to work on. Also, to bridge the “initial experience gap”, we came up with a startup guide about how the LilyPad Arduino works, in vernacular terms to bring them up to speed. Maloney, Peppler, Kafai, Resnick and Rusk (2008) talk about the how programming has been simplified in Scratch – the Scratch blocks help eliminate syntax errors, offers some form of feedback about the placement of command blocks, as well as gives feedback for experiments. Also, Resnick and Rosenbaum (2013) define tinkering as a valid and valuable style of working where the learner engages with a problem or project in a playful, exploratory and iterative style. This process involves trying out ideas, making adjustments and refinements, followed by experimenting with new possibilities. This is an iterative cycle. In our PD materials, we emphasize the colors of the blocks and the shape of the components – how they can be put together to form a programming sequence. At the same time, we also encouraged the use of immediate feedback from the LilyPad Arduino as the code is run, as ways to test out and debug their code. This tinkering and experimentation has to do with the Maker Mindset that we are trying to facilitate in the PD session. McCarthy, M. M., & Mangione, T. (2000). How undergraduate students identify and utilize informal mentors. NACADA Journal, 20(2), 31-37. This article focuses on the importance of informal mentorships with college students. For the purpose of our design challenge, we want to create a sense of community between professional staff, graduate student staff, and undergraduate students in Student Life and Learning. The concept of informal mentorship is important because, as the article tells us, mentorship leads to greater gains and retention for college students. Torres, V., Howard-Hamilton, M., Cooper, D., (2003) Dominant Cultures, Oppression, and Other Societal Issues Affecting Identity Development of Diverse Populations. Identity Development of Diverse Populations: Implications for Teaching and Administration in Higher Education. ASHE-ERIC Higher Education Report. (29)6. 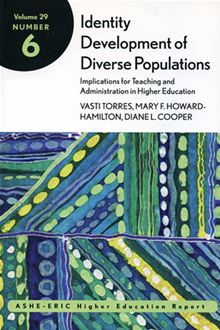 We chose to use this piece by Torres, Howard-Hamilton, and Cooper to help us understand the issues that may arise from dynamics in our system regarding underrepresented students and majority culture. We specifically wanted to create a sense of community across difference within Student Life and Learning because that is something that is important to the staff members there. It is also important to retain students of color and other underrepresented populations, and mentorship can help that. However, we needed to be sure that mentorship was sensitive to the dynamics of power, privilege, and oppression. Kafai, Y. B., Desai, S., Peppler, K., Chiu, G., & Moya, J. (2008). 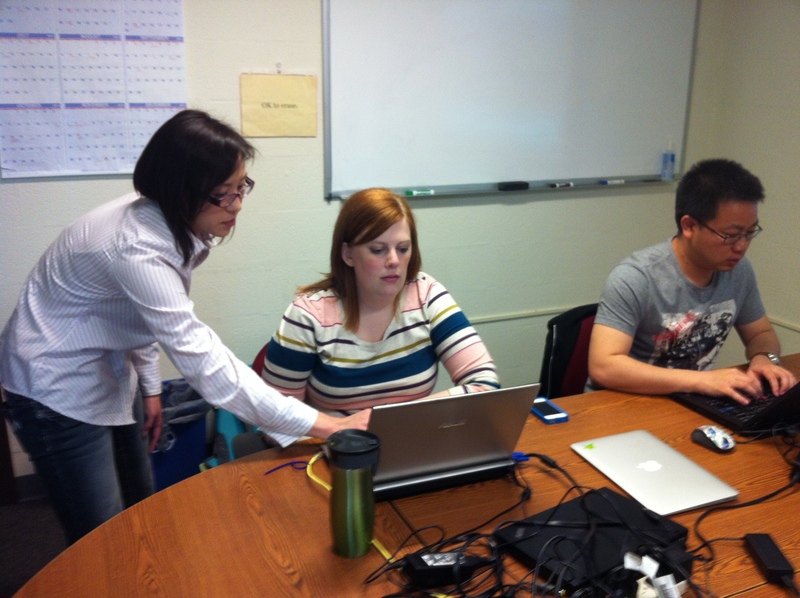 Mentoring partnerships in a community technology center: A constructionist approach for fostering equitable service learning. Mentoring & Tutoring, 16(2), pp. 194-201. OK, we have piloted a Hackjam session. We expected to keep it short and include only one of the activities we have planned. Also, this activity lasted only an hour but is listed to take at least 1.5 to two hours. We want to thank all of you who participated. We had a good time! We are attaching some awesome pictures we took at the session. In a nutshell, participants used X-ray goggles to “hack” a web page. For instance, Dai hacked the School of Education main page. Of course, we did no harm, because these hacked pages are saved on a separate Mozilla web server. While they were doing that, we have them post whatever new knowledge of HTML they were gaining on an online forum. This activity was encouraged by offering points and badges per certain amount of posts. This structure was set up on Youtopia, a resourceful site in which a point-badge structure can be foregrounded. Thus, we have learned that the activity is engaging and fun for graduate students, so it probably will be for teenagers. Also, we still need to figure out how to better introduce the points system to interfere the least with the content learning and intrinsic motivation that is already taking place. We are looking forward to refine a new iteration of the curriculum and get ready for the real one! As Christian and I have been going through all the various deliverables and the different elements that we’re planning on including in each, we realized that there was some pretty good overlap between our plans for the Design Workshop and Capstone Project Portal, so we checked in with the head honcho and got the ok for a combined approach, so long as we hit the requirements for each. Sort of a design challenge in it’s own right to make it work as both, but we think it’ll be fun. Wanted to post about it here since Kylie mentioned other folks might want to take a similar approach. So, feel free to poach this idea! MacRae, C. (2013), Teacher, researcher and artist: Thinking about documentary practices. In F. McArdle and G. Boldt (Eds. ), Young Children, Pedagogy and the Arts: Ways of Seeing (pp. 50-70). New York: Routledge. Abstract: This chapter is about three identities—teacher, researcher and artist—and the construction of new knowledge that became possible through both intellectual and imaginative work. MacRae uses this chapter as a means of thinking through ways in which these roles might work together, creating a space for reflecting on practice. She suggests there is potential for artist productions as a means of developing and thinking about documentary practices in early years settings. Application to our setting: MacRae found that documenting within the “teacher” identity often involved trying to fit the full complexity of the observed child into well-ordered categories on her observation sheets. Lived experience and the complexity of children defy such demarcation, and attempting to cram children into the gridlines of established observation protocols seemed disrespectful to her. Even “researcher”-like documentation, such as ethnography, risks “colonizing” children by trying to create an integrated portrait of them. On the other hand, looking at her documents with an artistic eye seemed to reveal more “depth and complex assembling” when she revisited her earlier documents of children’s art-making. “Field notes, photographs and film whose original function was to represent the field, became objects to be looked at—not to confirm what was already there, but to bring to the surface un-thought connections.” We need to avoid making our documentation system too systematic, and consider the possibilities and freedoms that art-based documentation could add to the conversation. The way MacRae mainly did her art-based documentation consisted of sketches and photographs with reflections. She also encouraged the children to take pictures and to post them to a blog, to which she also added her own reflections. Delpit, L. D. (1988). The silenced dialogue: Power and pedagogy in educating other people’s children. Harvard Educational Review, 58(3), 280-299. Abstract: This article, recommended to us by Daniel Baron from BPS, uses the debate over process-oriented versus skills-oriented writing instruction as the starting-off point to examine the “culture of power” that exists in society in general and in the educational environment in particular. Delpit analyzes five complex rules of power that explicitly and implicitly influence the debate over meeting the educational needs of black and poor students on all levels. Delpit concludes that teachers must teach all students the explicit and implicit rules of power as a first step toward a more just society. Application to our setting: Delpit makes an interesting point about how, “Teachers do students no service to suggest, even implicitly, that ‘product’ [as opposed to ‘process’] is not important.” From this, it seems that documenting the products children make in the BPS Makes work is just as important as documenting the process. The process is where we can see learning occurring, but the product is what is ultimately what the students will be “judged” by. Indeed, it seems as if, in the Maker community, the makers who are most celebrated are the ones who make the “coolest stuff.” We also need to be aware that so far, the Maker Movement has been dominated by the culture in power. We need to avoid documentation processes that make this clear power differential less directly visible, while also making it clear that all students’ voices are valued. Eubanks, E., Parish, R., & Smith, D. (1997). Changing the discourse in schools. In P. M. Hall (Ed.) Race, ethnicity, and multiculturalism: Policy and practice (pp. 151-168). New York: Routledge. Application to our setting: BPS has explicitly tried to align itself with Discourse II and the goals set out in this chapter to eliminate the predictive value of race, class, gender, etc. on educational (and consequently life) outcomes. We must therefore strive for our documentation system to fit within a Discourse II “learning organization culture” that values the learning of everyone above everything else. This seems to imply that any documentation the students do should advance their learning somehow, rather than being merely for teachers’ benefit or convenience. And teachers should also be able to learn from this; MacRae’s suggestion of combining student pictures with teacher reflections might be a way to promote teachers’ learning. Also, we should be careful of complaints about time, because “’Not having time’ is part of the sorting way of Discourse 1. If I (we) never have time to reflect, to consider, to question, then what prevails is how we do it now.” None of our suggestions should contribute to “sorting” students, either. So over the past week, Christian and I have been thinking about what sort of readings can support our work to come up with a redesign lab519. Wanting both practical as well as critical perspectives to inform the design of the fablab space, we ended up with two books that we’re going to focus on. The first, more on the practical side, is Make Space: How to Set the Stage for Creative Collaboration, by Scott Doorley and Scott Witthoft (2012). This book is a showcase of various design methods for setting up space to optimize collaborative design processes. The book is non-linear in its approach and can be picked up at any specific location, or indexed to specific areas of interest as they might relate to a particular design consideration that a reader may have. 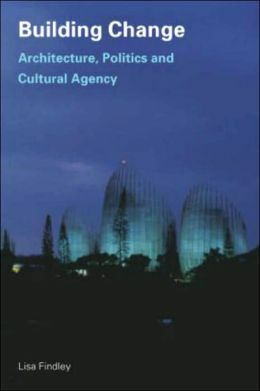 The second is called Building Change: Architecture, Politics and Cultural Agency, by Lisa Findley (2005). Filling in our more critical perspective, the book follows four architectural case studies of buildings around the world that address issues of power and cultural agency through how the space is manipulated. The book also highlights the ways in which the architects and designers are sensitive to and tend to cultural issues within, both the structures themselves, and the space those buildings reside in. We’re hoping going through the case studies and issues of power raised in the book will help us stay critical in our final design phase.